For the first time, McDonald's legendary shamrock shake is being sold nationwide. NEW YORK (CNNMoney) -- McDonald's extreme-green shamrock shake is going nationwide for the first time, the fast food franchise revealed on Wednesday. The leprechaun-colored shake is currently available at every one of McDonald's (MCD, Fortune 500) 14,000 U.S. restaurants, according to company spokeswoman Ashlee Yingling. The shamrock shake itself isn't new. 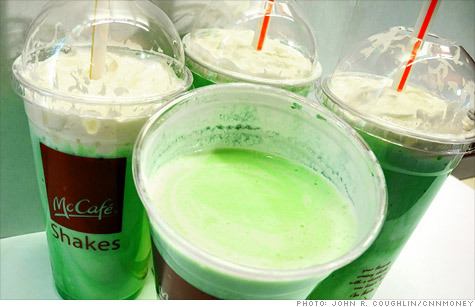 It's been offered by McDonald's restaurants at or around St. Patrick's Day since 1970. But in the past, only certain restaurants offered the familiar green shake. In its 42 years of existence, the shamrock shake has developed what McDonald's refers to as a "cult-like" following among certain aficionados who prize its vivid-green hue. So where does the shamrock shake gets its color? It's basically a vanilla shake with mint flavor, said Yingling, and it gets the green hue from the syrup. Like many of McDonald's products, the shamrock shake once had its own mascot, named Uncle O'Grimacey, who appeared in commercials while singing a jaunty jingle about the shake. O'Grimacey is an Irish version of the more well-known Grimace character, a rotund, purple creature of uncertain origin. O'Grimacey is green, of course, and unlike the naked Grimace, he wears clothes: a vest with shamrocks on it and a top hat of the sort worn by leprechauns. But O'Grimacey won't be pitching the shamrock shake this year. "We will not be bringing back Uncle O'Grimacey or the jingle you referenced," said Yingling, when asked about his whereabouts. In fast food parlance, the shamrock is considered a "special" shake because of its exotic look and flavor. Not one to be outdone, the fast food franchise Jack in the Box (JACK) offers its own "special" drink: the bacon shake. The bacon shake debuted on Feb. 2 and is only available for a limited time at certain restaurants, said Jack in the Box spokesman Brian Luscomb. He said the bacon shake contains bacon-flavored syrup. But it contains no actual bacon, so it could actually be consumed by vegetarians, so long as they don't mind milk products. The bacon shake also contains a lot of calories: 773 for a 16-ounce drink, according to Jack in the Box. That's more than a 16-ounce shamrock shake, which contains 680 calories, according to McDonald's. But what did you expect? It's a milk shake! "Shakes are typically higher in fat and calories, but the bacon shake has about the same nutritional content as the other shakes," said the Luscomb, comparing it to other Jack in the Box products.